Christmas was quite fun this year. 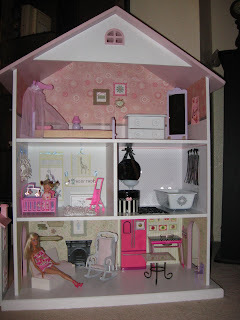 My beauty girl asked for a barbie sized doll house for Christmas. 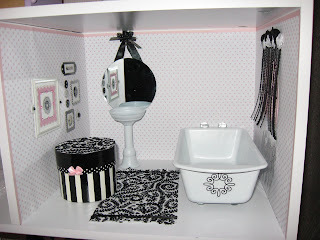 Have you ever priced a plastic barbie house? $150 is a "Good deal". So I found a bookshelf ($60)that was in the shape of a doll house and converted it! My mom helped with the wall papering of the whole thing (which was lots of work) and I did the decorating and furniture placement(and making in some cases). The bathtub was a bread pan with glass rocks glued to the top for faucet knobs and to the bottom for feet. The pedestal sink was a candle holder. Both were spray-painted white. The dresser in the upper room was a jewelry box, painted white. 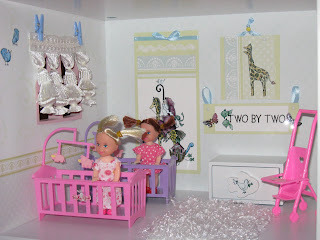 The nursery was for twins and the curtains are tassels. The kitchen table was a 19 cent tile glued to a candle holder. 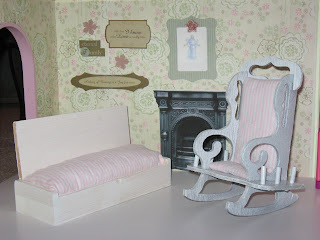 The couch was a trinket box, that was stuffed with a cushion (that I made) and the rocking chair was a pincushion, reupholstered and painted white. The fire place was a print out from a website of an actual Victorian replication gas fire place. The fridge is an actually Barbie refrigerator. But that is the only thing that was truly "Barbie" The rest was a knock off or started out as something quite different. It was an absolute hit! We finished opening gifts at 7:45am and she played with it until we left at 12:30pm to visit family. When we got home, she was back into her doll house until bed time. 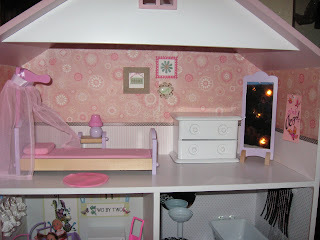 The doll house is adorable! And the bathroom fixtures are so clever.